In a previous post we discussed the relationship between movement and learning. In this post we will look at the benefits of play. When you are using games the team members are participating in play. Here is one quote about play. Play allows children to use their creativity while developing their imagination, dexterity, and physical, cognitive, and emotional strength. Play is important to healthy brain development. The following video has a different take on play but certainly illustrates creativity and imagination. So what are some of the other benefits of play. …it [play] allows children to develop creativity and imagination while developing physical, cognitive, and emotional strengths… Play enhances physical health by building active, healthy bodies… Play contributes to healthy brain development… In addition, play and recess may increase children’s capacity to store new information, as their cognitive capacity is enhanced when they are offered a drastic change in activity… Play is essential to developing social and emotional ties…It teaches them leadership as well as group skills that may be useful in adult life. This quote lists a tremendous number of benefits of play. Playing is important to our daily lives and our maturation. So can play be just as beneficial to adults. The following TED talk continues to look at play as being more than fun. It also looks at play as an important endeavour throughout the life span. Stuart feels that play should be constantly part of our lives. 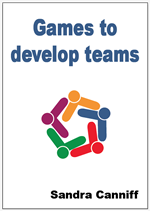 Adding games to team training adds play to the lives of all of the team members. It can be a very beneficial addition to the program for so many reasons.